What is the Fastest Small Pouch Laminator? What is the fastest small pouch laminator on the market? The SprinterLam 330R6! This incredible lamination machine will speed through your laminate pouches quicker than you can say "I love my new SprinterLam laminator". Well, ok, it's not quite that fast...but it will run at up to 5 feet per minute and, for an office laminating machine, this is simply unmatched by any other unit on the market. The SprinterLam is manufactured by James Burn, known throughout the world as one of the highest quality equipment manufacturers. Their attention to detail and overall goal to meet customer's demands at a fair price sets them apart from all the other brands out there. What makes the SprinterLam so fast? The 6-roller system! Most office laminators have a heat plate or maybe just 2-4 rollers...but the 6 roller laminating machine distributes heat over a wider section of your pouch, which increases the adhesive activation speed. 4 of the rollers are heated, and 2 are cooling, which also helps seal and finish the lamination quicker than other machines. This pouch lamination machine takes about 5 minutes to warm up, and has an adjustable temperature from 0° F to 284° F. This makes it great for prints of all kinds, from basic printed paper, to full color prints, and even sometimes foil laminating. You can also customize the speed settings, so you can slow it down if you are working with material that is particularly difficult to laminate and needs a bit more time in the heat rollers. The SprinterLam laminator has a 13" wide feed opening, so you can laminate all kinds of standard width documents up to about 12 ½" or so. It features a reverse function so you can prevent jams if you mis-feed a document, as well as automatic shut off that occurs after a short cool down period. • 6-Roller System: 6 rollers is more than your average lamination machine, and distributes heat more efficiently over a wider span of your documents. 4 of the rollers are heated and 2 of them are cooling. • Adjustable Speed & Heat: Lets you customize the machine to your specific applications, and makes it easy to switch from plain paper to thicker paper stocks. • Easy Controls: Designed for simplicity, the control panel is easy to use and understand. A handy conversion chart is on the machine for easy reference. • Reverse Functionality: Helps you prevent jams and damage to the machine when document lamination sheets are placed in the feed crooked. • Strong Air-Cooling System: For fast, high quality cooling and finished lamination. • Automatic Shut Off: If not used for 2 hours, the power automatically switches to cool down mode and shuts off once the cool down cycle is complete. 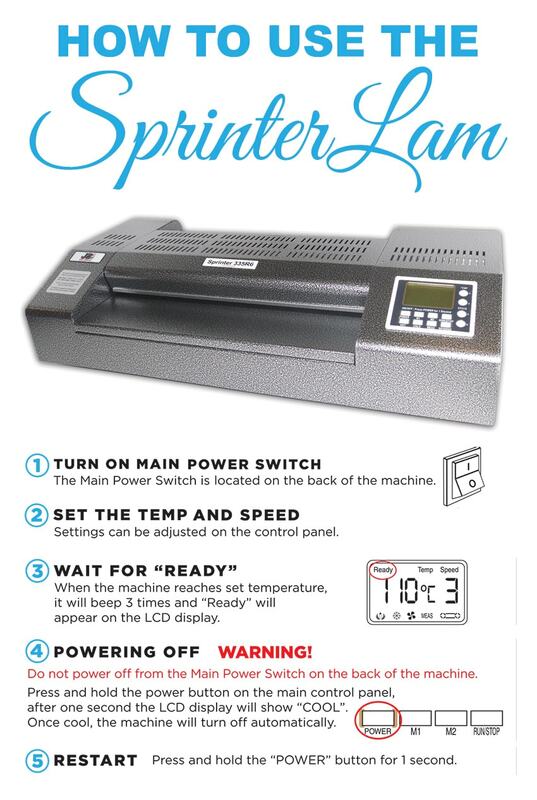 Don't settle for a cheap office laminator from the supply store when you can increase efficiency with the James Burn SprinterLam 330R6. It is CE certified and comes standard with a 1 year limited manufacturer's warranty. Don't forget to pair it with the highest quality lamination pouches, available here.